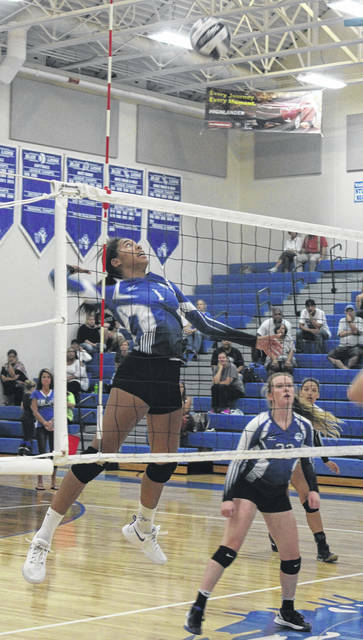 Washington’s Rayana Burns (1) goes up for the kill during a non-conference match at home against Madison Plains Wednesday, Sept. 5, 2018. Also pictured for Washington is Halli Wall. The Washington Lady Blue Lion varsity volleyball team held a non-conference match against former South Central Ohio League opponent Madison Plains Wednesday, Sept. 5. Washington dropped the first set, then won the next three to win the match. Scores of the sets were: 18-25, 25-17, 25-21, 25-20. “We started off a little slow and struggled to get a rhythm of our own game,” Washington head coach Ashley DeAtley said. “Madison Plains played a very scrappy game with a lot of energy and perseverance, but luckily, we were able to pull out the win. “They capitalized on our errors and took advantage of the times when we were struggling to close our block,” DeAtley said. “Aaralyne Estep did a nice job of keeping a lot of balls off the floor. Statistically for Washington: Halli Wall had 27 assists; Rayana Burns led with 6 aces, 8 kills; Hannah Haithcock had 10 kills, 2 digs; Brittney Wilson had 3 aces, 5 kills, 3 solo blocks; Maddy Jenkins had 3 solo blocks and 3 aces and Aaralyne Estep led with 18 digs. Washington won the j-v match against Madison Plains, 25-11, 24-26 and 25-14. Washington travels to Western Brown for another non-league match Monday with the j-v starting at 5 p.m.
https://www.recordherald.com/wp-content/uploads/sites/27/2018/09/web1_Rayana-Burns-vball-9-5-2018.jpgWashington’s Rayana Burns (1) goes up for the kill during a non-conference match at home against Madison Plains Wednesday, Sept. 5, 2018. Also pictured for Washington is Halli Wall.